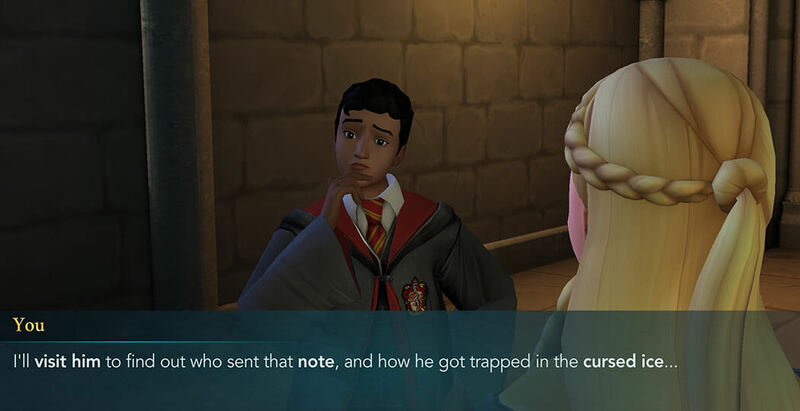 Hello everyone, welcome to Chapter Three of Year Two of our Magical Journey Walkthrough for Harry Potter: Hogwarts Mystery. 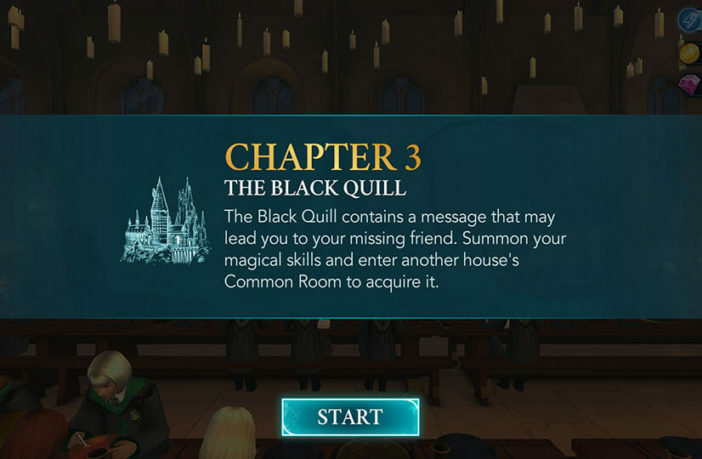 In the previous Chapter, we finished all the preparation for entering the Slytherin (or Gryffindor) Common Room in order to find the Black Quill that could lead us to Ben’s whereabouts. Hopefully, nothing bad has happened to him. 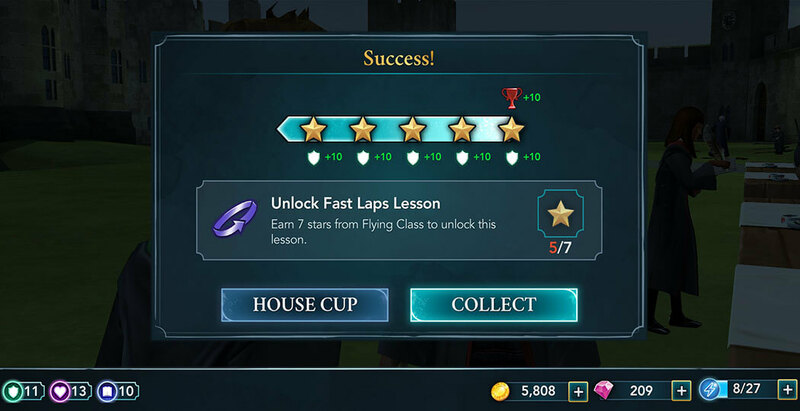 Now that you are prepared, there is an eight-hour waiting period before the Gryffindor versus Slytherin Quidditch match starts, so in the meantime, it is best to focus on the lessons. Tap on the GO button and proceed to the Training Grounds. Once you are there, tap on the exclamation mark to open the lesson window. 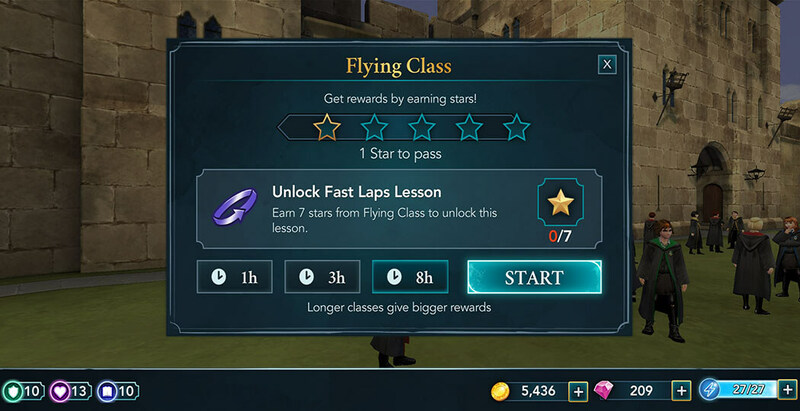 To unlock Fast Laps, you need to earn a total of seven stars from the flying class. The fastest way to achieve this is by doing an eight-hour and a two-hour class, but if you want to get some additional attribute points, it is recommended to do two of the eight-hour classes. When you decide what class to take, hit the Start button to begin. 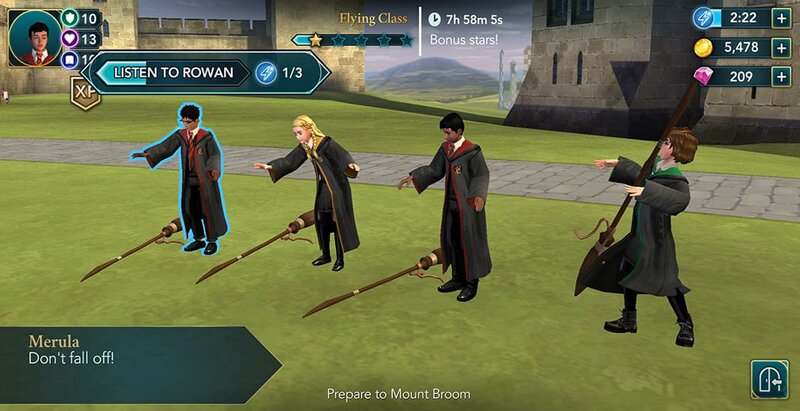 Do this the same way as any other classes – complete actions by tapping on the glowing objects in order to fill up the star meter. 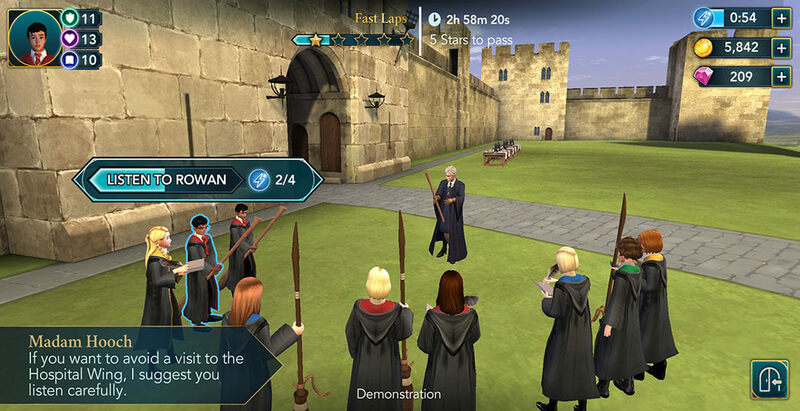 Also, try your best to successfully complete the mini tasks since each of those will award you with ten Courage points. After you complete these classes, hit the Collect button to continue. 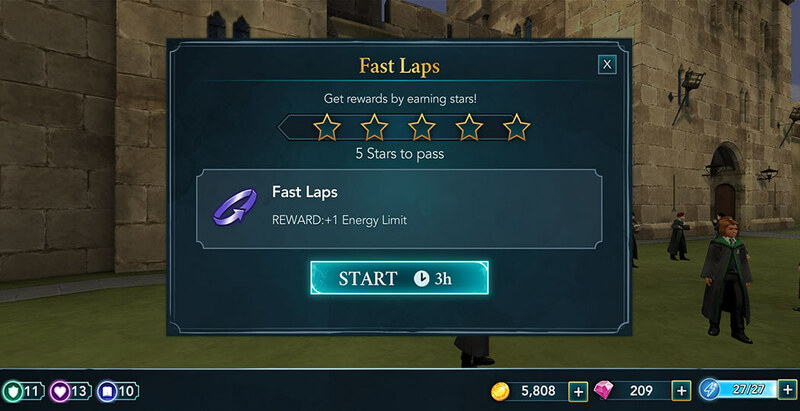 Once you’ve obtained all seven stars, Fast Laps lesson should be available. Tap on the GO button and proceed to the Training Grounds. To pass this lesson, you need to earn five stars within three hours, so it is strongly recommended to start it with full energy. Like before, watch the star meter and try not to optimize energy usage, and you shouldn’t have any problem completing this lesson. And as usual, watch out for the mini-tasks. 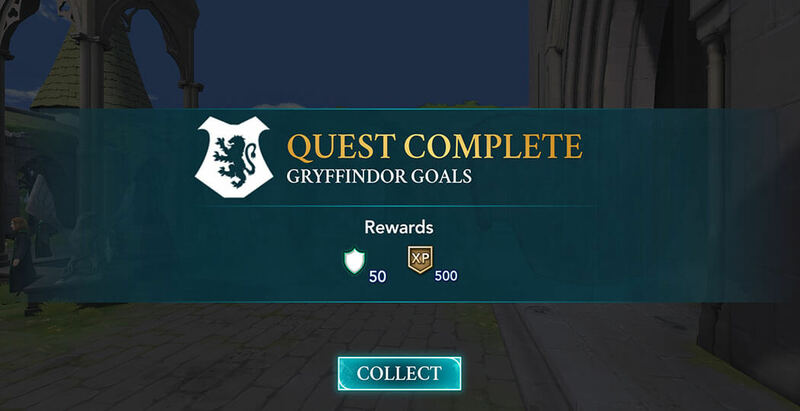 Completing each of them will earn you a nice amount of Courage points. 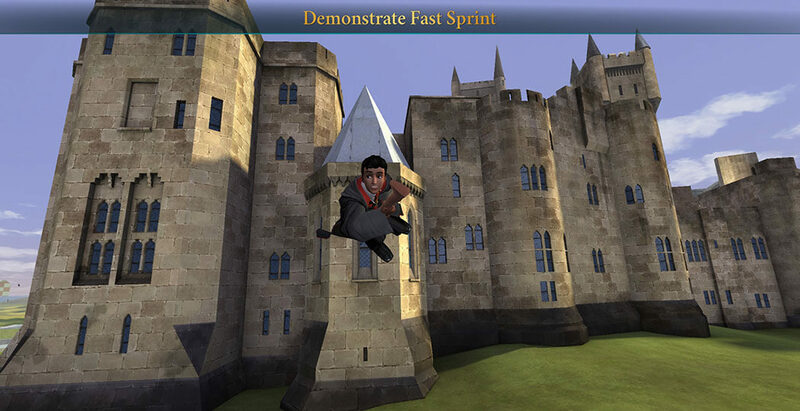 After obtaining all five stars, you’ll be tasked with demonstrating the Fast Sprint. Trace the path on the screen to perform this feat. Congratulations! Watching your character soar through the sky sure feels amazing! Now that you’re done with the lessons part of the Chapter, you can continue with the story. 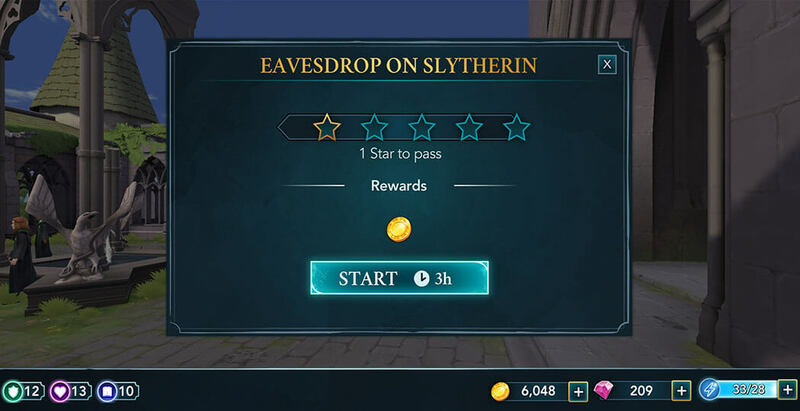 Hit the GO button and proceed to the Slytherin Common Room. You will meet with Rowan there, and he will seem awfully nervous. He will ask if you are really ready for this. You have three response options. Each of the choices will award you with five attribute points, but the outcome is the same – you will proceed with the plan. After talking with him some more, you will notice some of the Slytherin (or Gryffindor) students exiting their Common Room. Now is your chance to get in there. 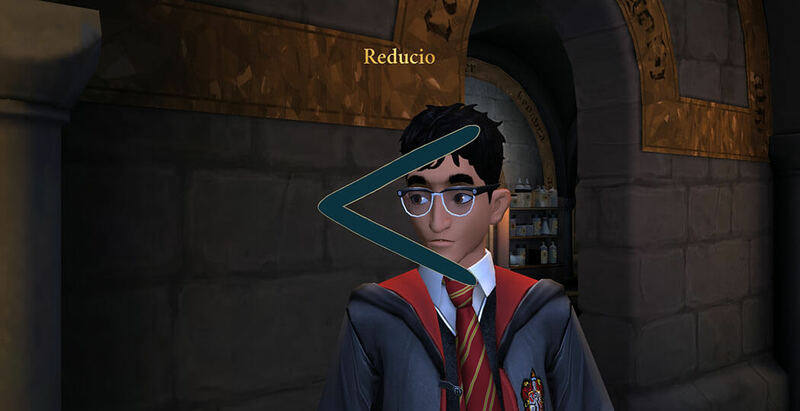 Trace the path on the screen to cast Reducio. 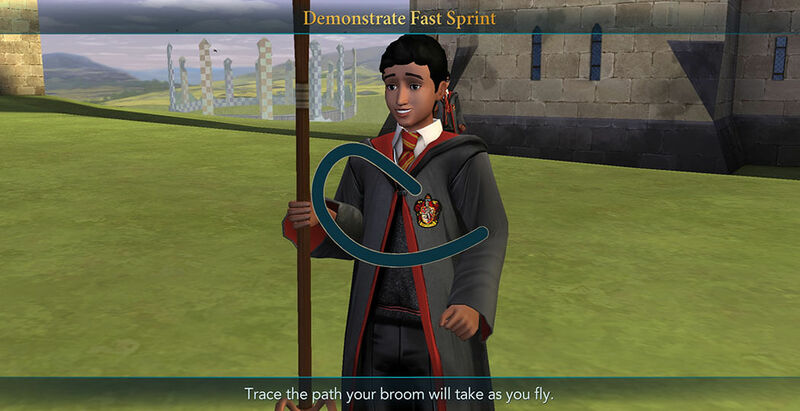 The spell will work and you will be able to enter the Common Room. As expected, it is completely empty, so you can use the engorgement charm to get back to your normal size so that you can search the room. 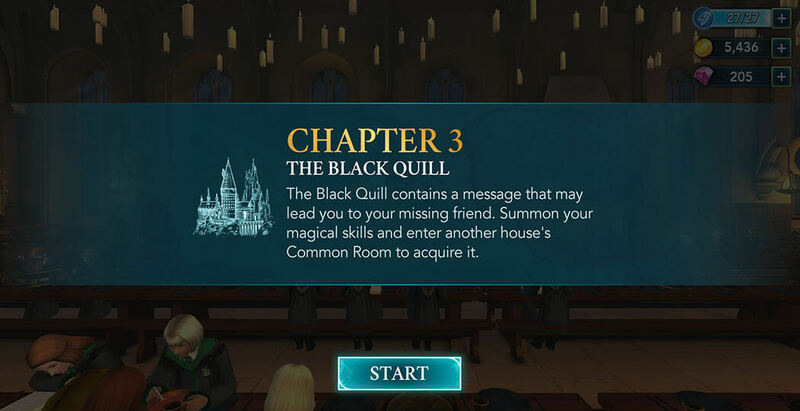 Finding the Black Quill will require you to earn five stars within three hours. It is advised to have full energy when starting this, to make things much easier. Once you are ready, hit the Start button to begin. There is not much of a difference between this one and any other task. Simply complete actions and you will fill up the star meter in no time. 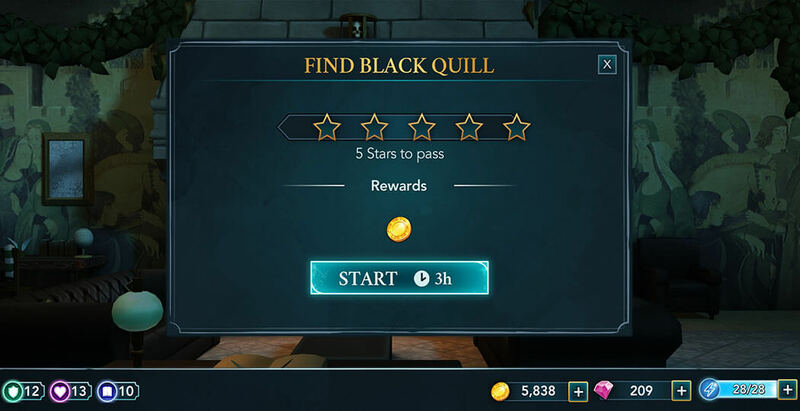 After earning all five stars, you will find the Black Quill. 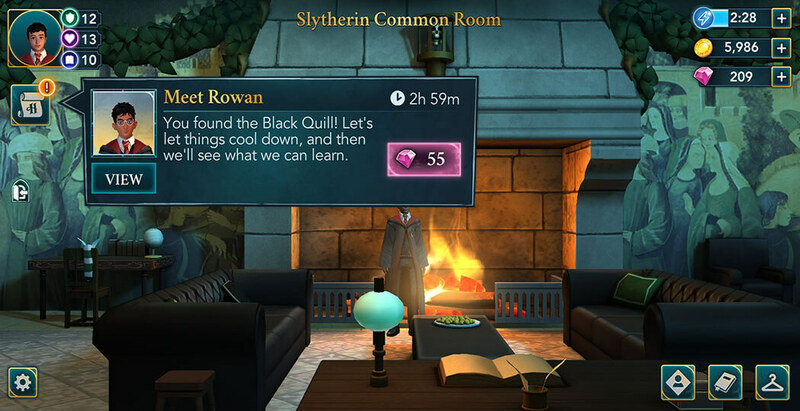 Your next task is to get out of there and meet with Rowan outside of the Common Room. However, there is a three-hour wait time for this task, so you can either wait or use some gems to speed up the process. Either way, once you are there, you will be greeted by Professor Snape (or Professor McGonagall) and he’ll ask you to explain yourself. You have two options – you can either tell him the truth or lie to him. Keep in mind that this is one of the important decisions you will have to make. 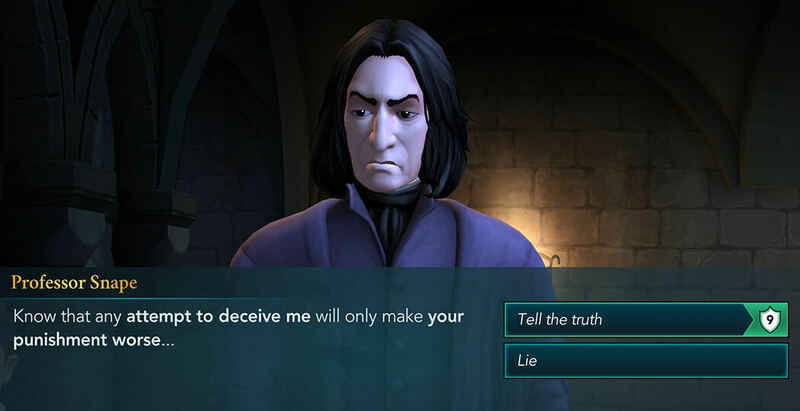 It is highly recommended to tell him the truth because not only will it award you with ten attribute points (compared to five you get for lying), but will also prevent you from losing house points (which would happen if you decide to lie). 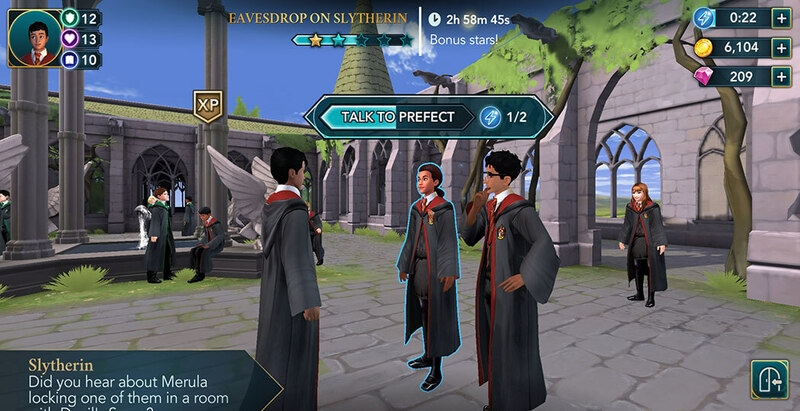 After explaining yourself, he’ll let you off the hook without any punishment and your next task will be to go to your Common Room and untransfigure the Black Quill. Once you are there, hit the exclamation mark to start the conversation with Rowan. After a bit of talking, trace the path on the screen to cast Reparifarge. The spell will work and the Black Quill will turn into another note. After reading it, you will find out it points to a corridor at the east end of the fifth floor. And this note, like the previous one, was signed by the same person. Is that corridor where Ben went? What is in there? 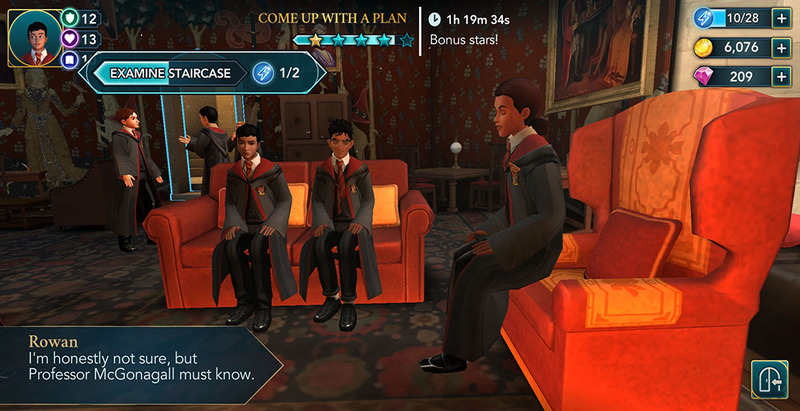 Not even Rowan knows. After a bit more talking, you can decide who to bring to explore the corridor with you. 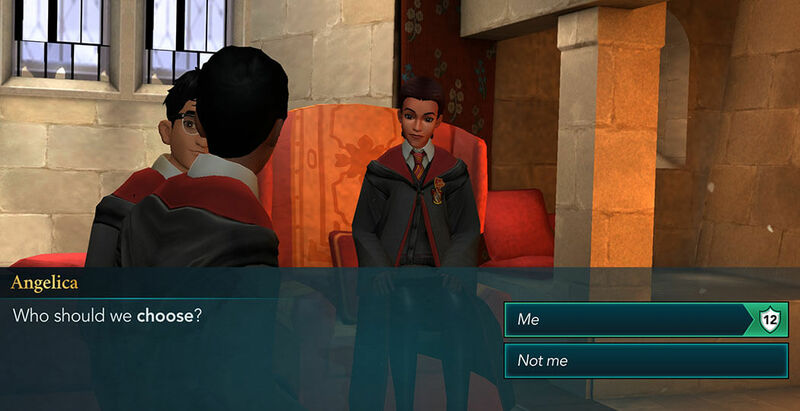 You can go with Rowan or take Penny along if your friendship level with her is two or higher. Regardless of the choice, there will be a three-hour waiting period before you can search the corridor. In the meantime, you can do a side quest for your house that just appeared. This quest is a bit different depending on the house you are in, but in general, all the steps are the same. 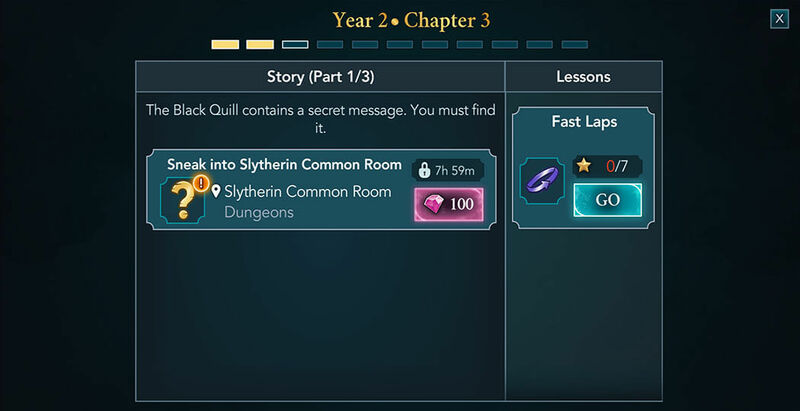 This walkthrough will showcase the Gryffindor questline, but the other houses have fairly similar quests, so you should have no trouble doing it no matter which house you are in. 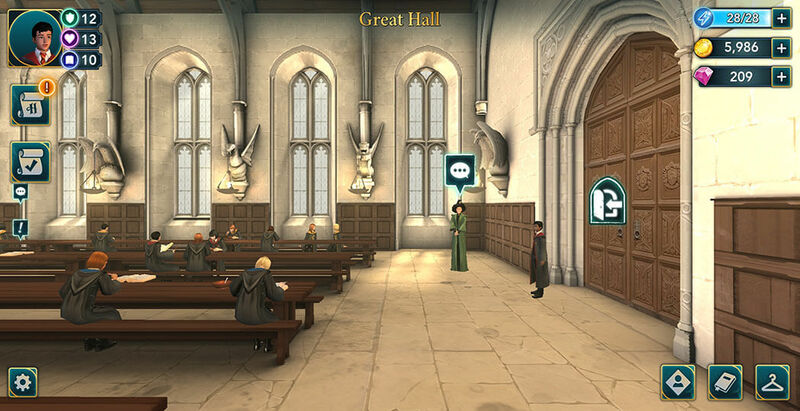 In any case, tap on the GO button and proceed to the Great Hall to meet with Rowan. Once you get there, you will notice the speech bubbles above some of the characters. Tapping on them will reveal what they have to say. Afterward, tap on the exclamation mark to initiate the conversation with Rowan. He will explain to you that there is a house meeting and you should attend it. 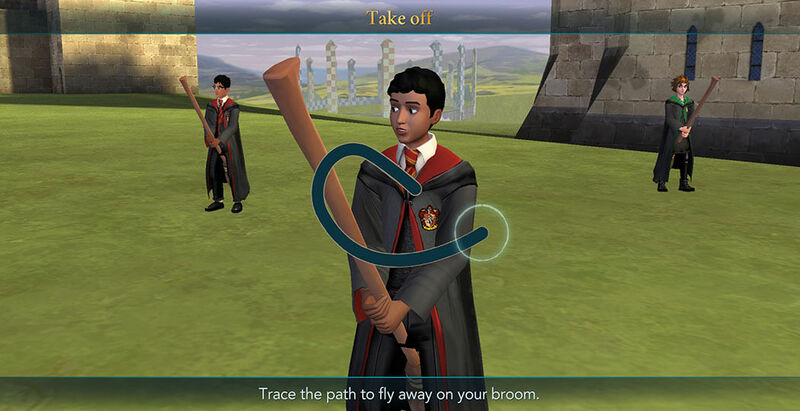 Hit the GO button and proceed to your Common Room. Your Prefect will explain the situation and after a bit of discussion, you will be able to start the task. You need to earn five stars within three hours, but only one star is required in order to pass. Do this in the same way as any other task, tap on the glowing objects to complete actions and earn stars. After completing this, you will be given a choice to take a lead role in the plan’s execution. 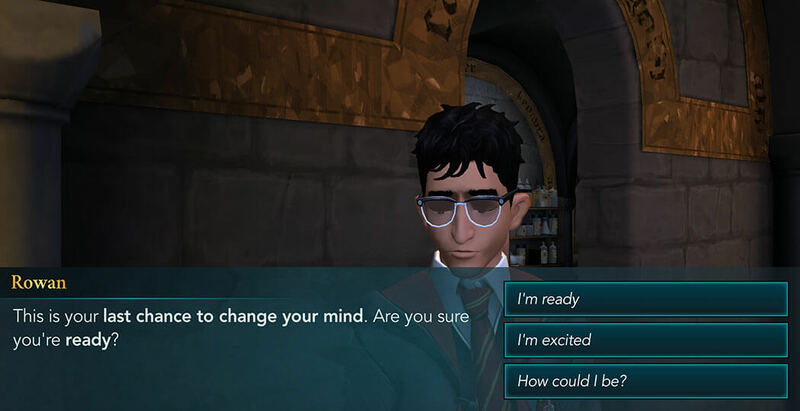 To choose this option, you need to have level twelve in the Courage attribute. This is the preferred choice since it will give you ten Courage points and will make your Prefect see you in the much better light. 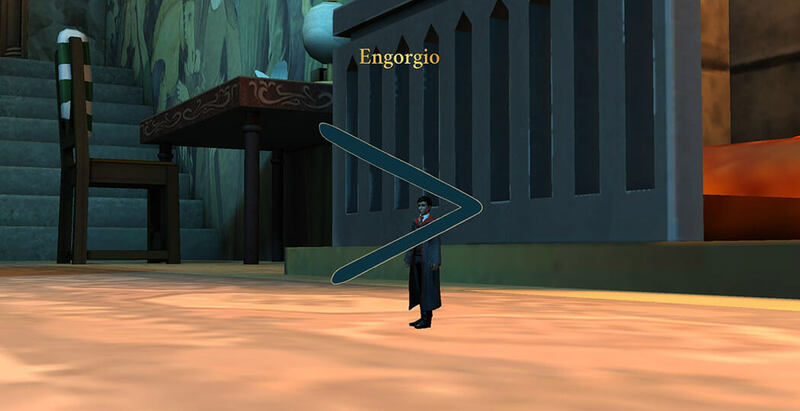 Your next task is going to the Clocktower Courtyard. There is, however, a three-hour waiting period before you can do so. You can either wait a bit or use some gems to remove the waiting time. When you are ready, tap on the GO button and proceed there. After gathering and discussing the plan, a task window will open. To complete it, you need to earn five stars within three hours. Only one star is required to pass, so it shouldn’t be a problem completing this one. Once you are ready, hit the Start button to begin. Do this task in a similar manner to any other and you won’t have any trouble completing it. 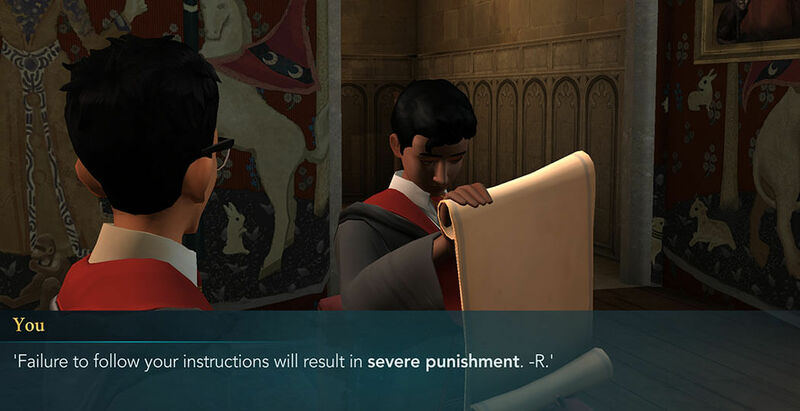 After you are done, you’ll witness one of the Slytherin students bullying a Gryffindor, so you’ll be able to act and stop it. 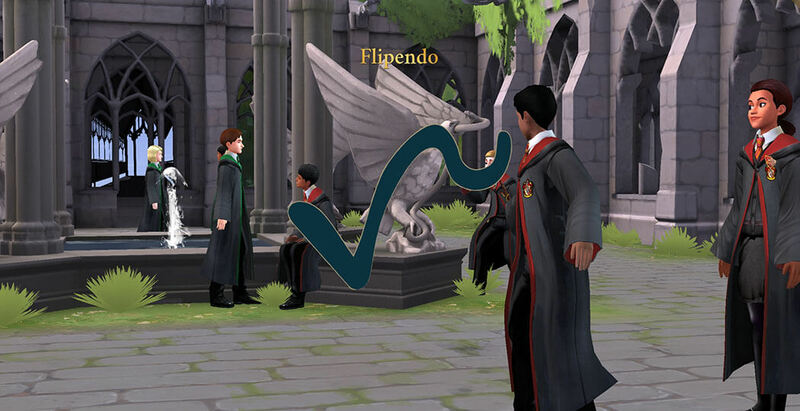 Trace the path on the screen to cast Flipendo. It will knock the bully directly into the fountain pool. 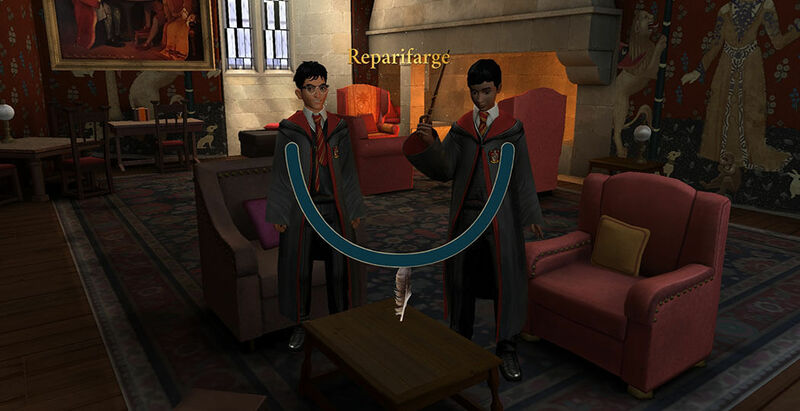 Your Prefect will be very happy that you managed to defend your housemate. This will complete the quest and earn you some nice rewards. Afterward, your next task is to explore the corridor. 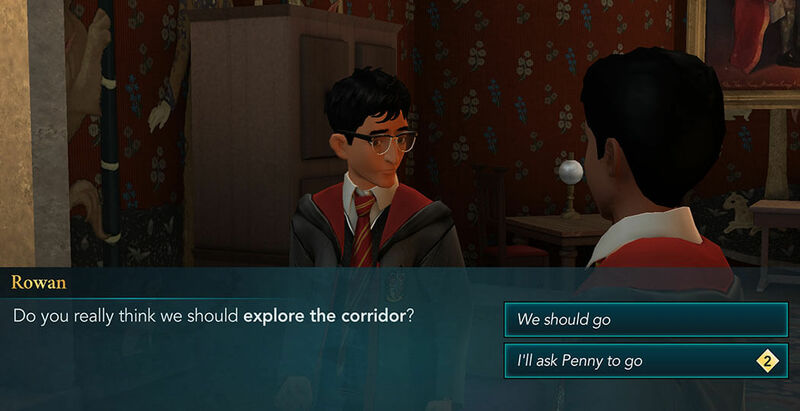 When you get there, you’ll meet with Penny or Rowan – depending on which one you choose to bring along. You will also notice that the cursed ice is spread all around the corridor. 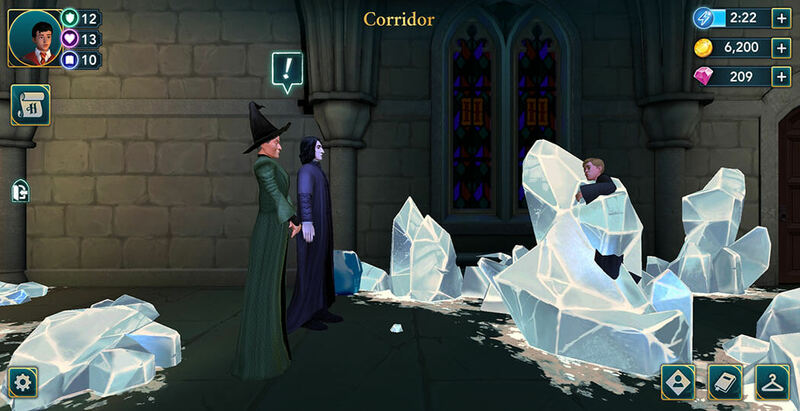 Also, you will see Professors McGonagall and Snape standing near Ben, who is apparently encased in ice. Tap on the exclamation mark to continue. After listening to them for a bit, you will get a new task window. To complete it, you need to earn five stars within three hours. Passing will, however, require only one star. When you are ready, hit the Start button to begin. While completing the actions, you can read some of the interesting lines of dialogue. 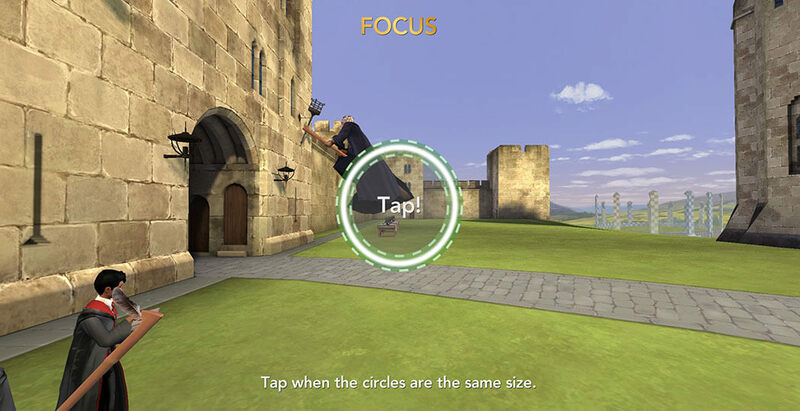 After completing this task, Professor McGonagall will attempt to free Ben with the knockback jinx. 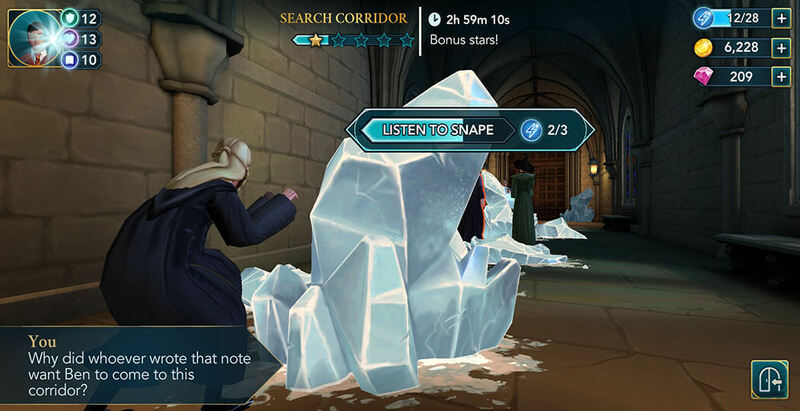 Apparently, it won’t work, and Professor Snape will suggest using Incendio to melt the ice away. After a bit of discussion, they will decide to use it and free Ben from the cursed ice. Your friend and you will agree that the best course of action would be to leave this place, and visit Ben in the Hospital Wing once he recovers. And this will conclude the Third Chapter of Year Two of our Magical Journey. Did you find this Chapter interesting and exciting? What choices did you make? 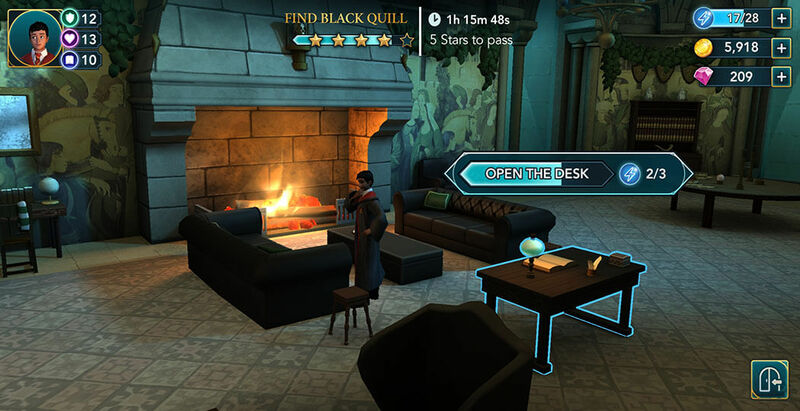 Did you take the lead in your house quest? Who did you bring along to the corridor? Let us know in the comments. Thank you for reading and see you soon with another Chapter or this amazing adventure!